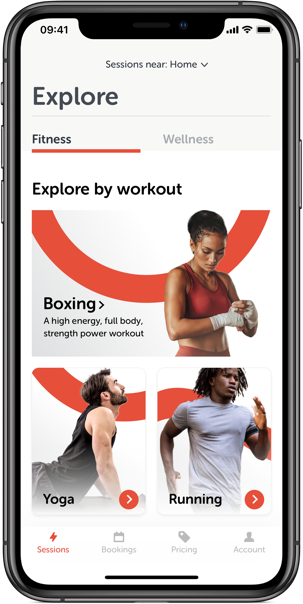 Train with TruBe and have access to London’s largest network of on-demand personal trainers, yoga, pilates and boxing instructors and massage therapists. Receive a personalised fitness programme based on your goals and lifestyle. Bring your bookings to life with 3 simple steps. Booking a personal trainer has never been so simple. Find a personal trainer and massage therapist in seconds. Switch between 12 specialised disciplines including Yoga, boxing, pilates, massage and more. Pick a time, date and enter your chosen location. Choose a personal trainer or therapist for the same day, or up to 90 days in advance. Once you have found your fitness trainer you can confirm in seconds. With TruBe you pay as you train, no contracts, no joining fee and no more wasted memberships. Inclusive pricing. Clear and consistent pricing with the freedom and flexibility to access all aspects of TruBe. Cash-free payments allow you to keep track of your spending. Purchase a TruPack to receive discounted sessions for you and up to two friends. Quality guarantee. Each personal trainer and massage therapist has been hand-selected and verified. With TruBe you can trust that you are booking with the best personal trainers and massage therapists in London. More than an app. As part of the TruBe community, you can book a free consultation with one of TruBe’s in-house specialists. Receive recommendations based on your goals, preferences and location. Stay on track with personalised session feedback from your personal trainer/ massage therapist. Whether you will be focusing on weight loss, body conditioning, sleeping pattern or stress levels, this complimentary offering will help get you started. A member of the TruBe team will recommend a personalised workout schedule and will help you incorporate wellness disciplines into your routine. Find out more about the TruBe trainers and mobile massage therapists and receive personalised recommendations based on your goals. The consultation is a complimentary service consisting of a half an hour phone call with one of TruBe’s in-house specialists. Choose from a range of real experts with real-time availability. Adapt your workouts to achieve your goals. TruBe trainers and therapists will develop the best program for your needs, each TruBe package will give you full access to all our services. Choose your discipline and book a private personal trainer. Explore profiles, disciplines and locations. Read personal trainer reviews and compare ratings. Book with confidence, your session will be conducted by a fitness and wellness specialist. Your personal trainer/ massage therapist will provide all necessary equipment required for you session. Each TruBe personal trainer and massage therapist will create a personalised programme based on your goals. Pay-as-you-go or purchase a selection of sessions with a TruPack. Receive a digital receipt and a confirmation email for each purchase. Share your TruBe experience by splitting the cost of your TruBe fitness and wellness sessions with up to 2 friends. Experience a range of disciplines, personal trainers and therapists. Choose your intensity and receive post workout/ massage notes. I had a fantastic experience with TruBe- my trainer really listened to me and targeted the areas I wanted to work on. He was friendly and very knowledgeable! Highly recommend this amazing app! TruBe trainers are fun, enthusiastic and very knowledgeable! Such a great resource for anyone wanting to get fit but not sure how to or what kind of exercise they like. So many different things to try and extremely flexible! The instructors and organisers have been consistently helpful and go above and beyond to ensure the service we offer to our members is consistent yet adaptable when we need it to be. I would without a doubt recommend TruBe. TruBe is constantly growing, each personal trainer will offer you an unforgettable experience. Get the most out of your TruBe experience by joining our Newsletter, be the first to hear about promotions, updates and more! Experience a variety of fitness and wellness disciplines lead by industry specialists. With TruBe you can push your limits with one of the best personal trainers in London, then sit back and relax with one of London’s best massage therapists in the comfort of your home. Yoga, boxing, kickboxing, meditation, pilates and more all available to book in seconds. Download the free TruBe app today for added convenience. Make same day bookings, or plan your sessions up to three months in advance.